"But the Spanish Lady was not so easily defeated. The sick-list swiftly rose to over ten thousand. Hundreds of police officers and trolley drivers fell ill. So many firemen were sick that the capital's Fire Marshall feared 'the whole city'd burn to the ground if a fire ever got started'. The Federal government was paralysed and the courts went into recess. At Herbert Hoover's Food Administration, half the employees went off sick. Congress dosed its public galleries and at the State Department staff were 'aired' for twenty minutes every day, taken outside and instructed to breathe deeply. As he studied Washington's mortality figures at the Vital Statistics Bureau, a clerk named W. E. Turton collapsed and died. The Washington Evening Star ran a regular column entitled 'Prominent People Who Have Died of Influenza'. As soon as we returned to Washington the 'flu epidemic, which had been raging in various parts of the country, struck us with full force. The city was fearfully overcrowded, the departments had had to expand and take on great numbers of clerical workers. 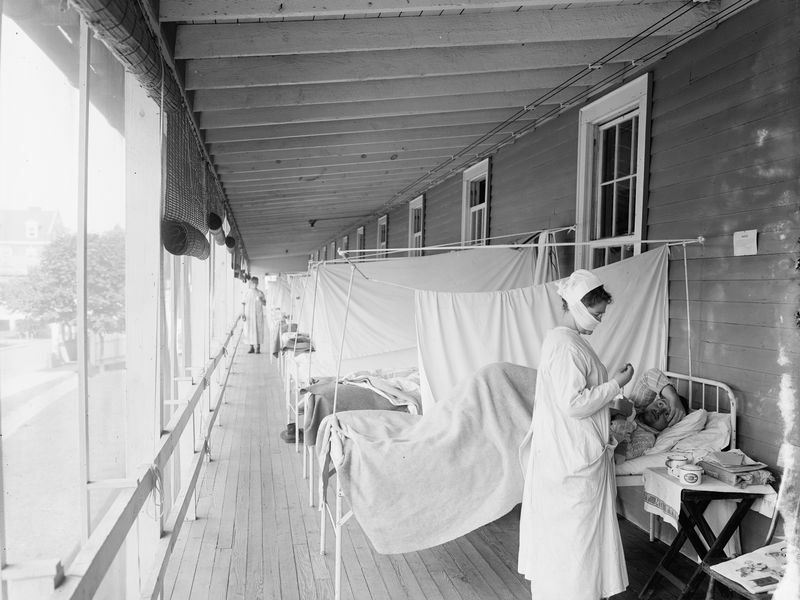 New bureaus had been set up, girls were living two and three to a room all over the city, and when the 'flu hit there were naturally not enough hospitals to accommodate those who were stricken. The Red Cross organized temporary hospitals in every available building, and those of us who could were asked to bring food to these various units, which often had no kitchen space at all. Before I knew it, all my five children and my husband were down with the 'flu, and three of the servants. We succeeded in getting one trained nurse from New York ... this nurse was put in charge of Elliott [aged eight years old] who had double pneumonia. My husband was moved into a little room next to mine, and John, the baby, had his crib in my bedroom, for he had bronchial pneumonia. There was little difference between day and night for me, and Dr Hardin, who worked as hard as he possibly could every minute of the time, came in once or twice a day and looked over all my patients. He remarked that we were lucky that some of us were still on our feet, for he had families with nobody able to stand up. "Despite the constant anxiety for her own family, Eleanor tried to take the opportunity to do some good in Washington: 'If all the children were asleep I went in the car and visited the Red Cross."